Support the efforts of Operation Clean Sweep® by taking action to spread the word about the campaign. Operation Clean Sweep® provides a manual, checklists, guidelines and other resources and tools – all designed to help your company keep resin pellets, flakes and powder out of the environment. Operation Clean Sweep® is an international program designed to prevent resin pellet, flake, and powder loss and help keep this material out of the marine environment. 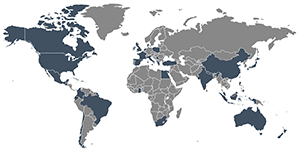 Many other countries license the Operation Clean Sweep® program. We’ve created an interactive map to showcase the countries around the world that participate. Click each highlighted country for details. To demonstrate your commitment to a clean environment, please complete the “Pledge to Prevent Resin Pellet, Flake, and Powder Loss”. Completing this pledge will qualify your company’s name to be added (unless otherwise specified) to the list of our Program Partners on the Operation Clean Sweep website. Your company will receive a certificate suitable for display that affirms your commitment to being an Operation Clean Sweep partner.